Electro Magnetic Components is an ATM parts manufacturer that specializes in stocking only a few different types of high quality US manufactured ATM parts. Shown below are pictures and ATM part numbers for several Diebold feed shafts and the Diebold stripper fender. 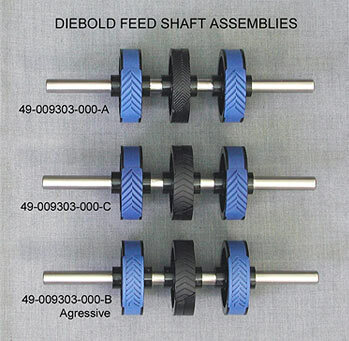 The photo on the right shows three versions of the older style Diebold feed shaft including both the regular and the aggressive. 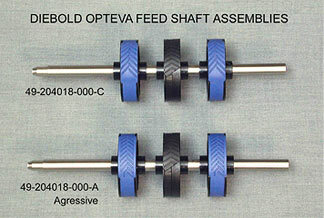 The photo on the left shows both the regular and aggressive Diebold Opteva feed shaft. We also offer rollers and belts for Diebold ATM card readers along with a complete selection of magnetic card reader heads. These ATM parts are always in stock and can be shipped the same day we receive your order. EMC has been a specialty ATM parts manufacturer for over 30 years producing magnetic heads, rollers and belts used in the card reader portion of ATM machines. During this period EMC has adapted the company to respond to the changing ATM parts market. Currently, EMC is focused on being a high quality, price/performance supplier to the ATM spare parts market offering primarily ATM parts for Diebold, NCR and Wincor. In addition, we stock magnetic heads for Fujitsu, Tranax, Nautilus Hyosung, Hantle, Triton, and Tidel ATM maintenance. If you have a requirement for LoCo or HiCo magnetic card reader heads used in point of sale, swipe reader, dip reader, insert reader, encoder, or other magnetic head applications please visit www.magneticheads.com If you have a magnetic card reader head requirement not shown on our web sites please contact us to send a sample. From the sample we will give you pricing and delivery for the replacement head to match your requirement.